You can see that the ruts were created by mountain bikes with skinny tires, not fat bikes, when it was warm. 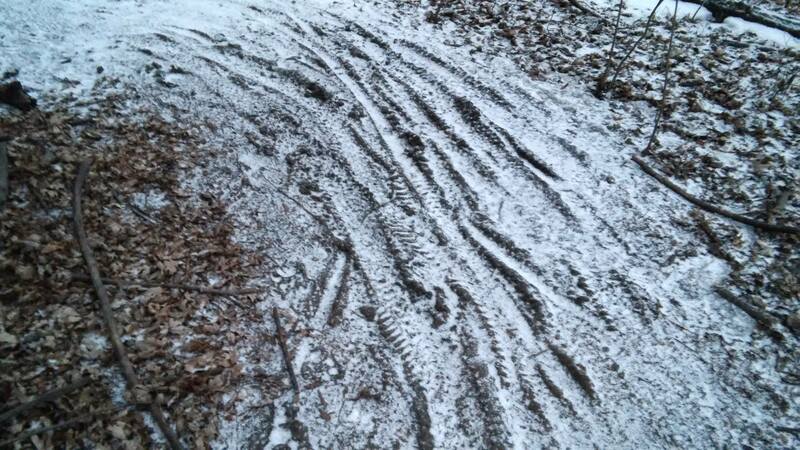 The ruts then froze and they’ll likely remain a problem (nobody likes to ride ruts, muddy or icy) till they get covered up with snow, or until the spring thaw. We don’t have strict rules yet for the Sechler trail, in part because it’s our first winter, in part because the trail goes through the river bottoms that floods frequently, and in part because we’ve not sculpted the trail, with the exception of a small segment of the Velodrome in the Figure 8 loop. But we want to instill good habits among our ridership. It’s not likely we’ll completely prohibit bikes with tires less than 2 inches wide in Sechler, especially during a crappy winter like this, the trail has been rock hard much of the time. But you get the idea. And if we do get heavier snowfalls and the trail has snow on it that’s deep+soft+packed, we request that skinny tires wait until the pack gets harder.